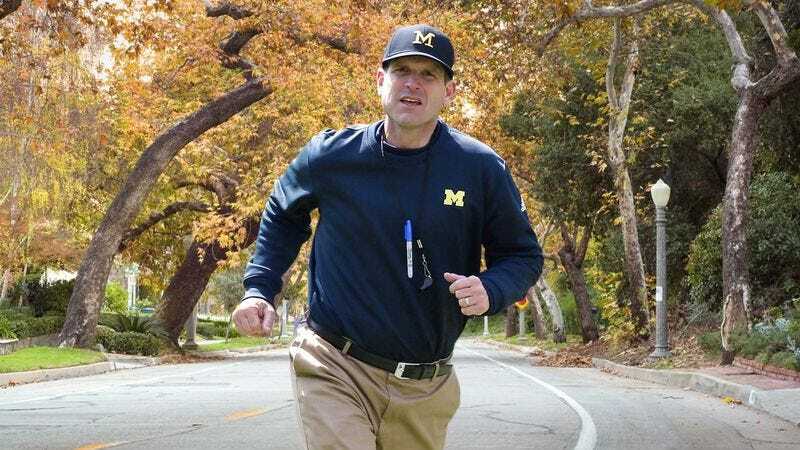 ANN ARBOR, MI—Explaining that it’s a great way to fit some daily exercise into his otherwise incredibly hectic schedule, University of Michigan head coach Jim Harbaugh reportedly started his day off Friday by taking an early morning sprint through Ann Arbor. “I’ve been doing this for years—it’s a great way to get your day going,” said Harbaugh, who begins every day by waking up at 6:30 a.m., putting on his running shoes, and sprinting at full speed for the entire duration of a six-mile run through various neighborhoods near his home. “I like coming out here right around dawn, since no one else is really awake at that hour and the air is so crisp. It really gets the blood flowing.” Harbaugh added that he always likes to finish every run strong by screaming at the top of his lungs for the last half mile.